We welcome a review or feedback from our Safari clients. Fulfilling or even exceeding all expectations and wishes you may have before a trip. Not really possible, right? An OLD BRIDGE MOBILE CAMPING SAFARI makes it possible. This is something you can’t describe. You have to experience it. 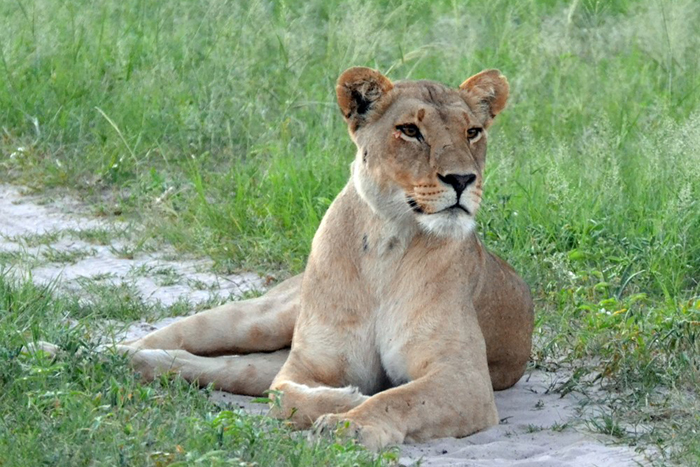 Two days in Chobe National Park and two more in Moremi Game Reserve are an incredible lesson in the diversity of nature. And they’re something that can only be done right with an incredible team – and it’s that team we want to send a big, fat thank you to. Modumo, a guide with extensive knowledge of all the big and small creatures, of all the processes and relationships of this wilderness, who had an answer to all of our questions. Who speaks impeccable English and transmits a sense of absolute calm and security even as lions and hyenas are roaring nearby. This guy is just amazing. Modumo took us to observe lions, leopards… snakes, water monitors, turtles… eagles and secretary birds… and many more. Experiences we’ll never forget and images we’ll always carry with us. Thank you so much! Our top chef Prince was also very important. Every meal was delicious and a culinary surprise. Since we all enjoy cooking, it’s not that easy to delight us with a good meal. Prince did just that every single day. He deserves that star! On top of that, he was always in contagious good spirits, which he woke us up with in the mornings. Prince speaks so many different languages. Thank you! The third member of the team was Hub, a big fat thank you to him as well. Always hardworking and on the go. Even in the mid-day heat he was scrubbing, cleaning, tidying. The quiet good spirit of the team. If you want to experience the wilderness of paradise, full of adventures and luxury, you’re definitely on the right path with this incredible team. After departing Maun and heading into the bush, it wasn’t long before animals started appearing among the shrubbery. A family of giraffes were the first to grace us with their presence, followed by a herd of elephants, along with impala. We were even lucky enough to see a lone ostrich and buffalo. We were amazed as we hadn’t even gone through the gates of Moremi yet! On arrival at the camp, our crew of three set about starting a fire and setting up camp. 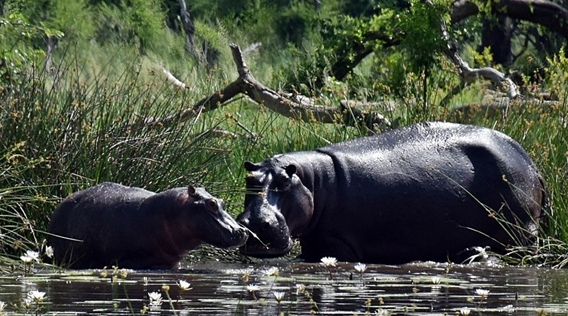 To our delight our camp was only metres away from the river, where we immediately saw a mother hippo with her young. It’s amazing to think that hippos can ever be that small! After eating our lunch we departed on our afternoon game drive. We were astounded by the magnitude of the birds, which displayed themselves in every colour imaginable. Then we saw elephants, lots of elephants, from young calves all the way to majestic matriarchs, playfully splashing around in the cool waters. 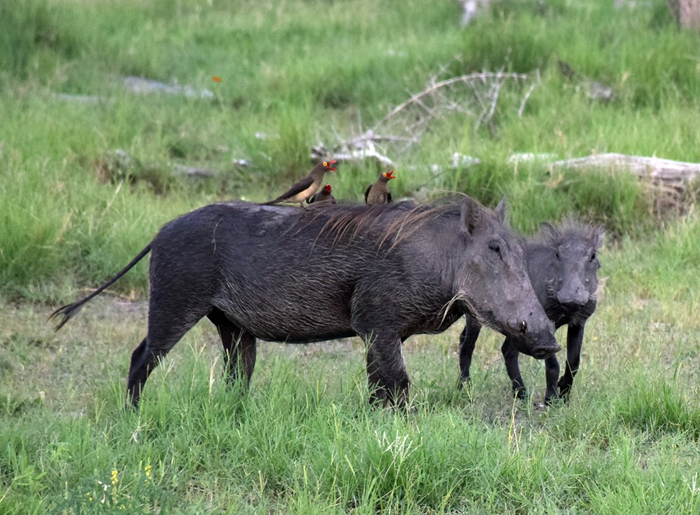 However, my favourite sighting of the afternoon was a family of warthogs, with the male of the group carrying three oxpeckers on his back. I’ve only ever seen glimpses of these animals, as they always seem so skittish. However, the male in particular seemed to want to show off his entourage of oxpeckers. We were welcomed back to our camp with delicious aromas of our dinner filling the air, a roaring fire, and a table of snacks and drinks. Our meru tents had been erected, which I have to admit were a lot larger than we had imagined. Warm bucket showers had also been prepared; our crew had certainly been busy while we had been away that afternoon. As the night drew in, our camp was illuminated by solar lanterns, giving it a somewhat whimsical ambiance. As we sat down to a mouth-watering three course meal, hippos could be heard grunting and elephants trumpeting away in the distance. This is a dining experience that would be hard to top by any five star restaurant. After the most comfortable night’s sleep, we were woken up for our morning game drive, we stocked up on rusks and cups of tea then we were off. We saw lots of mother and baby sightings; including a young zebra feeding, beautiful giant eagle owls and even a hippo crossing the road! Arriving back in camp we sat down to a full English breakfast, only to be joined by a herd of elephants. It was safe to say this was the safari experience I could only have dreamed of! We sat for hours watching hippos, birds and of course our resident elephants, who didn’t seem concerned by our presence. 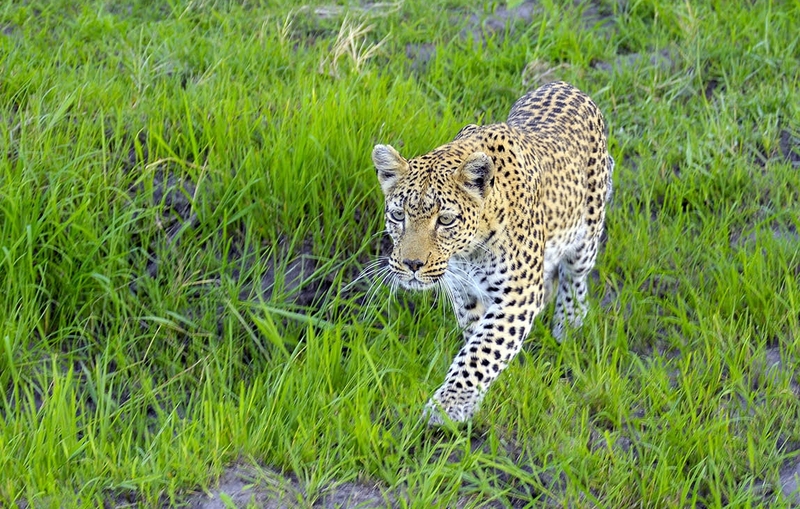 On our afternoon game drive we were blessed to see a leopard. The whole vehicle sat in silence admiring her beauty. And that night our resident herd of elephants returned. They were clearly after a noisy midnight snack and swim. We watched them from our tents as the full moon illuminated the tusks of the mature elephants. It was the most spectacular night. On our last day we were up before our wake-up call, ready and rearing to go. Five minutes after leaving camp, we found a lone lioness snoozing in the middle of the road. Unconcerned by our presence, we watched her roll around and perform her morning stretches. Not long after our lioness sighting we headed off into the dense bush where we saw a pack of wild dogs lying in the tall grass. All of a sudden, they were up and off on the prowl, with a sense of urgency in the air. As we followed them at a distance, we saw the pack head into a clearing where a herd of zebras we grazing. The pack started to disperse and approach the herd. As the dogs edged closer, the zebras alerted each other with a number of snorts. They decided that they were not going to be on the menu today. 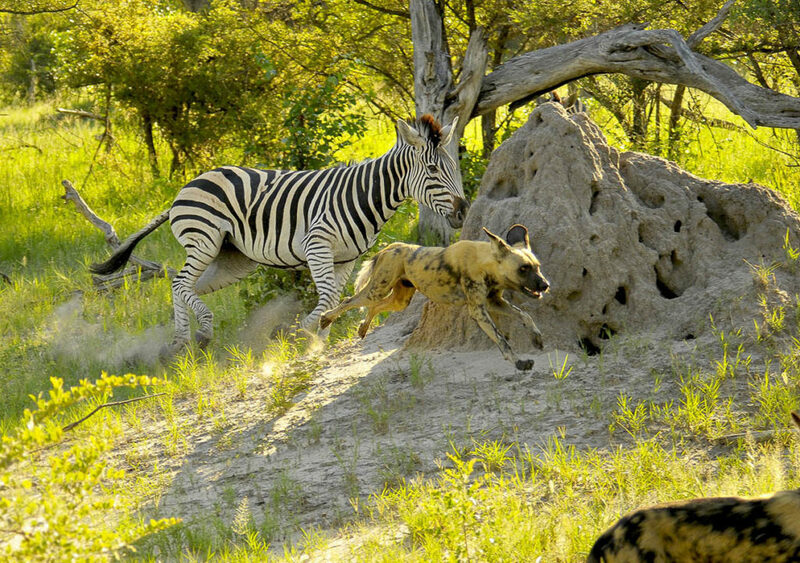 Two of the herd darted towards the wild dogs and chased them away from the rest of their family. They continued to drive away the group of predators until the pack made the decision to carry on with their morning patrol in the hope of finding easier pray.To top off the most remarkable game drive, our guide picked up leopard tracks. He informed us they were fresh and he would try and track her down. While we were admiring another group of elephants basking in the river our guide stopped the vehicle, and lo and behold, there was a leopard sitting on the edge of the dense bushes. After a few minutes of watching her, we noticed her cub! Another magical moment, not only to see this normally elusive cat, but her cub too. We sat watching them for a while before we decided to leave them in peace. 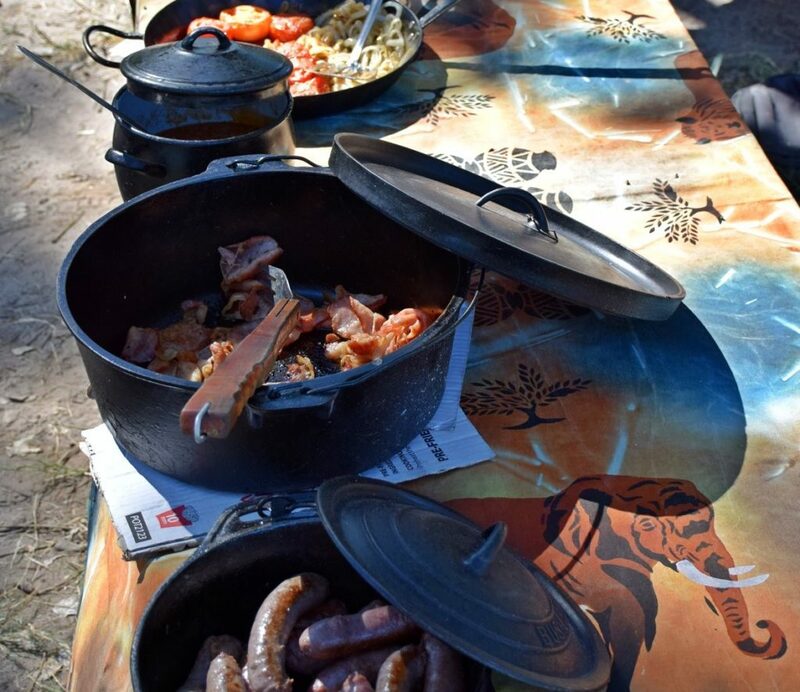 Thrilled and totally overwhelmed we arrived back at camp to a tasty breakfast fit for a king. Then it was time to leave our haven by the river and head back to Maun Airport for our flights back to Cape Town. Our guide was phenomenal, as were the rest of the crew. A mobile safari seemed like a good school holiday family adventure for two young teenagers, easily bored by museums or treks through old European cities. 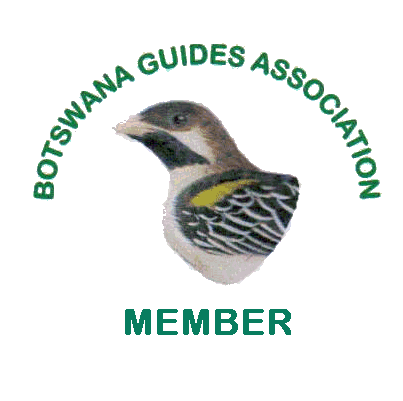 We chose Botswana because it was a safe country to visit, the size of France, and we had heard of the world famous Okavango delta. On our first three days we took a dinghy through the delta. By boat you can move rapidly and get amazingly close to the animals, and the huge array of colorful birdlife. The elephants seemed right at home in the marshland, not too disturbed as we approached. The crocodiles disappeared quickly into the water from their sunbaking. 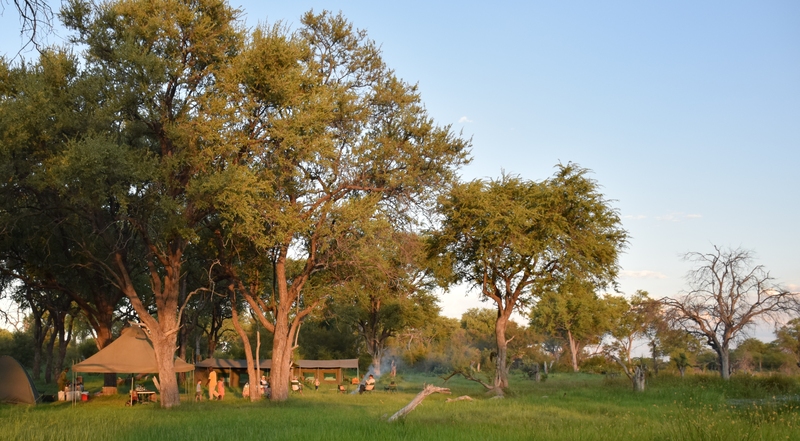 On the first night we arrived at our site, tents were already assembled by a beautiful lagoon, complete with a pod of snorting hippos. On arrival a startled impala bounded through the camp, being chased by wild dogs, then swam across the lagoon. On our walking safari the next day we came across a pack of 15 wild dogs, a rare sighting as there are only about 600 in all to Botswana. We then swapped the boats for land cruisers, and headed off for three nights to the Moremi National Park, told our chances of seeing some of the big four were good. Up at night to use the en-suite (a tarpaulin area at the back of the tent) I peered over to see the moonlit face of an equally startled elephant, just meters away. He moved on to the next tree for a good munch. More elephants offered themselves as a photographic backdrop in the morning, as we had breakfast. On the safari drives we were lucky to spot and observe leopard’s close-up, honey badgers, and incredibly a daytime sighting of a serval. We also came across a massive herd of over 500 buffalos. We moved onto the other side of the national park, again the tents were erected for us and delicious meals were prepared for us on the campfire. The advantage of tents is you hear everything, you get truly close to nature. This time we were woken early in the morning by the roar of male lions, seemingly close. Our super knowledgeable guide woke us to say we were skipping breakfast to board our vehicle and explore. Sure enough 500 meters up the road we came across two kings of the jungle, marking their territory, roaring at another pride. Magic. After a recovery night in Maun – where the kids got a quick wifi and screen fix, we headed off to Nxai Pan. Totally change of scene, with salt pans, majestic baobab trees and an arid open bush environment. The water hole made famous by the incredible IMAX movie ‘Roar’ was the epicenter of game drives. We watched the passing parade of elephants, giraffe, springbucks, and wildebeest seemed to take turns to rehydrate. The African sunsets were spectacular. And on the last night a mother cheetah decided to show off her frisky teenagers for our cameras. Tour operators The Old Bridge Tours & Safaris in Maun, and our guides, cook, camp assistants all took amazing care of us, ensuring we were safe and comfortable at all times. 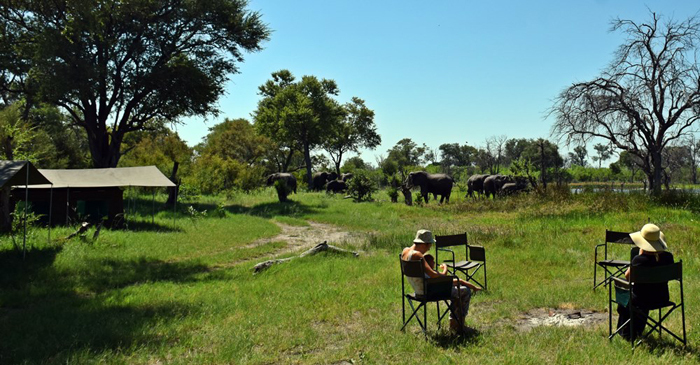 Botswana is a spectacular country, best seen in the true African style – by mobile tent safari. A totally magic and affordable experience for the whole family. My wife – Jane – and I have just spent a week at Old Bridge Backpackers: one night at Backpackers, one night mokoro trip, one night Backpackers, 2 nights Moremi, last night at Backpackers. The rating? 11 out of 10. Also deserving of high praise is Bisto at reception. It’s the friendliness and helpfulness she displays that made our stay such a pleasant one. Again, she played the valuable role of being the efficient coordinator of our holiday and a friendly place to land if anything needed to be sorted out. Then, to round off a memorable holiday, Prince our chef and Madaba our guide were of a standard beyond what we expected. The food was great and the game viewing some of the best we have ever experienced. Their friendliness added to the whole experience. All in all, thanks for a great holiday. You run a superb ship. Pete and Jane, (South Africa) Review. I hope all is well in Maun. I wanted to let you know that my wife Nancy and I had a simply amazing time on our two day boat safari….it could not have been any better. SP and Captain were amazing guides and provided great company around the camp fire at night. It was truly an experience that we will never forget! Mike & Nancy Kummerer (USA) Review. I just wanted to write and thank you for organizing such a fantastic trip for both Jane and I. It really was our dream safari (although far scarier than we imagined J). The guides you arranged for us (C-company and Moses) were both very professional, knowledgeable and friendly. They were able to track down and identify a whole slew of animals that would have been impossible for us to find on our own. 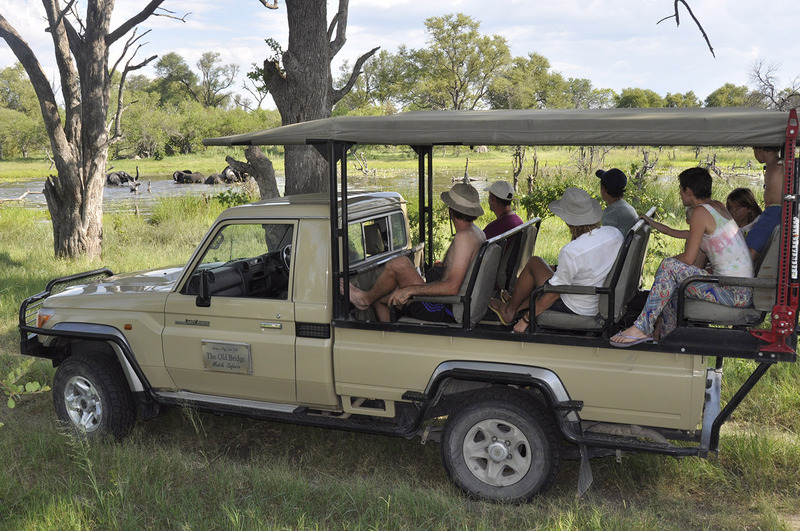 They really made the trip for us and will be recommended to everyone we meet who wants to do a safari. Moses in particular was fantastic and was more than willing to share his knowledge. I think learning from the two of them and hearing their stories were the highlights for me. Jarvis was also a perfect cook! Jane and I camp quite a bit in Canada and I can tell you that we’ll likely be importing some of his recipes (if we can replicate them) and his camp setup ideas- we both loved the lanterns for example and have been thinking of ways to replicate the effect on our own canoe trips. It was really a delight to come back in the evenings to a nice warm meal and friendly conversation. Leah Littlepage (Canada) Review. I just wanted to send this short email to say thanks again for being so helpful with booking the scenic flight, which was unforgettable, and arranging the mokoro trip for us. Spending a few days on the delta is seriously soul recharging stuff. Lee and his team were excellent, and Nadia pointed out that with Lee as our guide she always felt safe. He’s a serious guy and takes his job seriously, which in those conditions was good to see. Lee, Cross, Surprise, chef and the others were a pleasure to be around. He was quite happy to extend our bush walk on one of the days to track elephants, which he did successfully and much to our surprise. He also surprised us with a visit to the hippo pool one evening which was an unforgettable experience. Our trip great fun and very comfortable, and we’ll definitely be back (in the not too distant future). 8 days pleasantly immersed in the nature with a good guide and a good cook.